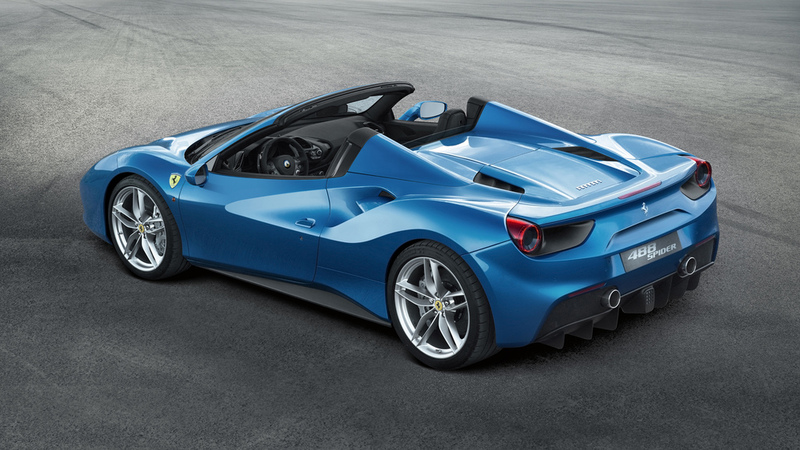 Ferrari has unveiled the new 488 Spider, its most powerful mid-rear-engined V8 convertible to date. Powered by a 3902 cc turbo-charged V8, that debuted recently in the 488 GTB, the powerplant pumps out 660bhp at 8000rpm. The 488 Spider can cover the 0 to 62 mph sprint in 3 seconds flat and from 0 to 124 mph in 8.7 seconds. The new engine not only offers 98bhp more powerful than the previous naturally-aspirated V8 but also has lower CO2 emissions. Ferrari says the turbo V8 has a unique character, delivering increasing levels of power right across the rev range, completely eliminating the traditional turbo lag with a throttle response time of just 0.8 seconds. This is thanks to a sophisticated production process made possible by Maranello's facilities - which are shared with the F1 team - to help transfer racing technologies to road cars. Ferrari claims it was the first manufacturer to introduce the RHT (Retractable Hard Top) on a car of this particular architecture, ensuring lower weight (-25 kg) and better cockpit comfort compared to the classic fabric soft-top. This model has its own distinctive soundtrack created using solutions such as exhaust headers with longer, equal-length piping and a flat-plane crankshaft. It was also further enhanced, says Ferrari, by an in-depth study of harmonics and tonality at different engine speeds. The sound is described as 'seductive but never invasive' when the top is dropped, with both volume and clarity increasing as the engine instantly responds to the accelerator pedal and revs rise, 'reinforcing the sensation of massive performance'. This is also the most aerodynamically efficient Ferrari spider ever built, thanks to the introduction of several innovative devices, including a blown spoiler and an aerodynamic underbody incorporating vortex generators. The Ferrari Styling Centre completely reworked the aesthetics compared to the 488 GTB. Designed around the concept of the retractable hard top, the 488 Spider has a spaceframe chassis made of 11 different aluminium alloys. This yields the same torsional rigidity and beam stiffness figures as the coupe, improving the chassis' performance by 23 per cent over that of its predecessor. The RHT folds backwards in two overlapping sections to rest flush on the engine, taking 14 seconds for the top to fully retract or deploy. The Ferrari 488 Spider will make its world premiere at the Frankfurt International Motor Show in September, 2015.